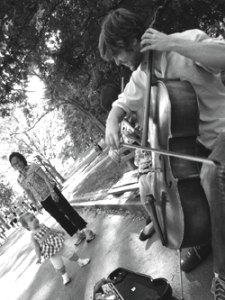 The music of Boston-based cellist and composer Daniel Hawkins springs first of all from the dense forests, rolling hills, and crumbling cities of his childhood Pennsylvania. After leaving the Keystone State, Daniel earned undergraduate degrees in composition (studying with Paul Lansky, Steve Mackey, and Dan Trueman) and cello performance (Sophie Shao, Susannah Chapman) from Princeton University as well as a master’s degree in contemporary improvisation from the New England Conservatory (Natasha Brofsky, John Mallia, Anthony Coleman, Tanya Kalmanovitch). He is the recipient of both the Helen and Isidore Sacks Memorial Prize for Excellence in Classical Music and Princeton’s Martin A. Dale ’56 Fellowship. His current projects involve the Driftwood Duet with violinist Rachel Massey, Ocelot with guitarist Lautaro Mantilla, and The Secret History, an album-length collection of electroacoustic solo and chamber music incorporating live acoustic performance, electronic parts controlled in real-time, and video. You can visit his website at danielhhawkins.com.